You saved me an email, Jeff. I never knew really what Ecomorph was, thank you for explaining. P.S., still loving Bodhi! I haven't tested Echomorph in a while, has it gotten past it's stability issues? Using current builds of everything enlightenment I've been using ecomorph for wobbly+expo for the last few days without any crashes. So other than a light colored theme and an animated background, what exactly is Bodhi missing from E17? 3.make a good theme like elementary with e17 and good icon sets(elementary based e17 theme will be really good..
4.please be minimal only in software selection...i would really like to see extensive customization of e 17 theme..
You are free to rearrange anything in Bodhi you like. The current default setup is designed to be something that is familiar and easy to use. If you do not like the defaults, well then feel free to change them! Enlightenment allows for a vast range of customization. No one default configuration is going to please everyone, so I really can't try to. Functionality is our first goal, if something in the current configuration hinders functionality, please let us know. Also, you ask me to utilize shelves more while at the same time you request I remove the top panel. 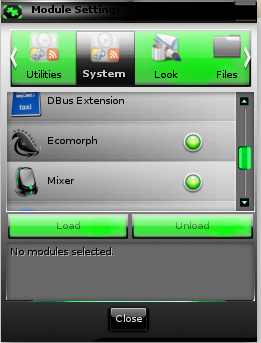 That top panel IS a shelf, as well as the application launchers at the bottom - they are contained in a second shelf. Finally, you keep mentioning you like the Sabayon E17 defaults... They are just the bland E17 "Standard" profile last I checked. You can turn your Bodhi configuration into this exact same look (it is not something the Sabayon team put together) with the profile selector in the E17 settings. Well, I'd like to say too that I did not find anything wrong with the shelves. 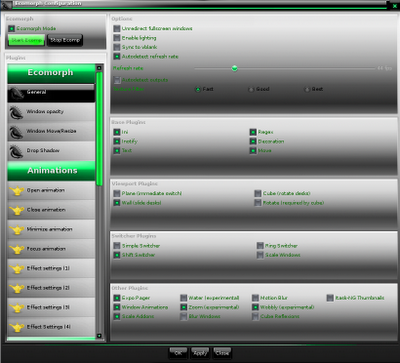 Besides that, all E17 configuration utilities are present in Bodhi. So, there's nothing else here, that Jeff can do. Regarding profiles, themes and icons, I also agree that no mater what Jeff chooses to place as default, in the iso, it would never satisfy 100% of users. That's normal and not important, providing that there are other options in the iso to choose from, witch is the case. Otherwise, most items allow user customization and it's even an almost unlimited number of possibilities to download from synaptic. 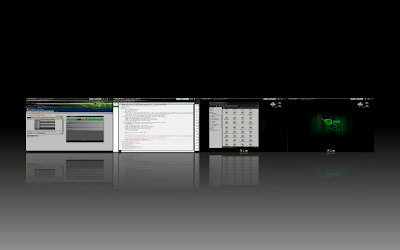 - avoid by default, that windows do overlap the panels, when they are maximized. - Some users (including the distrowatch owner) complained about wrong detection of their screen resolution. - In the standard install, the start button is almost invisible. It's better to change the shelve where it's located to "alternate" style. - If there is a way to tweak the location of the various items in the main menu, try to make it like users are used to see them at the more popular distros (I'm not sure how much possible that is, with Enlightenment). - The Enlightenment dialog boxes have no borders, making it difficult to distinguish them when they overlap or when they're too close from each other. So, there is nothing here that is too serious to overshadow Jeff's work and most small glitches can be fixed at next release. Others may improve or be fixed by Enlightenment, while they're cruising to their final stable releases. Not quite sure what to do to ensure correct screen detection... I've booted my LiveCD on over a dozen system personally now and EVERY time it has detected the right resolution. Really need some bug reports for specific hardware before I can pin down that issue. See, I kinda like how the main menu in enlightenment is laid out... Makes sense to me that system settings are, well under settings! Good feed back though mate, keep it coming! My machine didn't take the latest round of updates/upgrades too well and I ended up reinstalling from the newest iso. I installed ecomorph again and for some unknown reason it's failing to draw any windows. They show up on the taskbar, and I figured out by clicking around that they *are* there, only they're invisible. Any advice would be greatly appreciated!